While band fans continue to feel left out by ESPN's coverage, or lack thereof, of halftime shows at college football games, one ESPN personality has made it known that he himself is a huge fan of bands especially one band in particular. That band is the Temple University Diamond Marching Band. ESPN SportsCenter Anchor, Kevin Negandhi, has become one of the show's premier personalities and is beloved by millions of people across the sports world for his quick wit and voice. Now he can add the band world as fans of his. At the Military bowl this year, Neghandi was named an honorary captain for Temple. He is a Temple alum. Earlier this year the Temple band honored Temple alumni and famous Philadelphia icons. 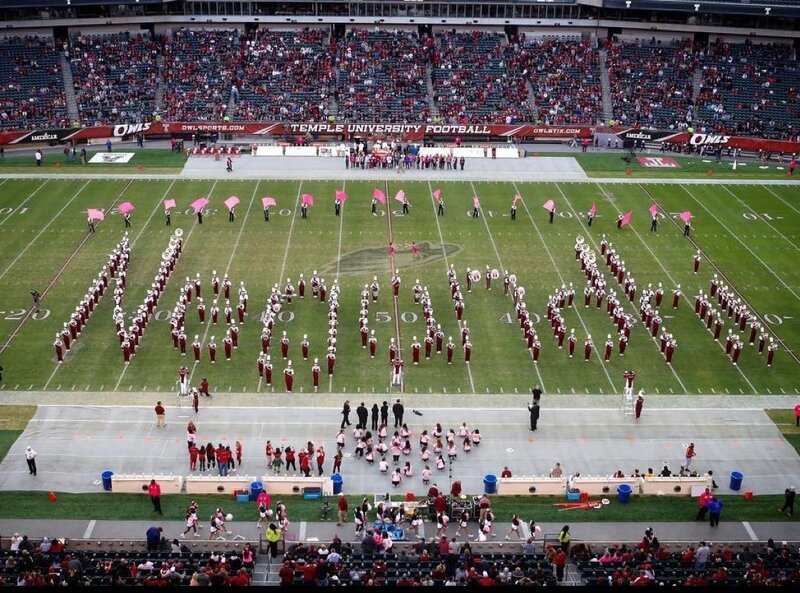 The band spelled Negandhi on the field in his honor. This totally caught him by surprise. At the game he made a point to go say thank you to the band and show them some love. To honor the band, Negandhi has changed his personal twitter profile photo to a picture of the band spelling out his name. Thanks for showing support for this great band Kevin!